This review was originally published to the now-defunct website The People’s Reviews in October 2000. It’s every American’s worst nightmare: terrorism hits at home, and it hits hard. When we are witness to these acts of violence in other countries, even when they are done to Americans, we can still displace some of the fear and feelings of being violated in the knowledge that these acts were still very far away. But anyone who was alive and conscious at the time remembers the bombing of the World Trade Center in New York, and of the federal building in Oklahoma City, and suddenly we weren’t so safe anymore. 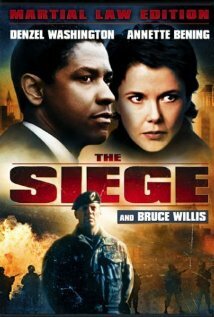 The Siege is a movie that preys on this feeling of inadequacy, the fear that we are only a breath away from unnatural and uncalled for death. In the film, we see a portrayal of the frustration at being impotent against the unseen threat, a threat that is very real and very close. It’s unsure to FBI Agent Anthony Hubbard and his Lebanese partner Frank Haddad why these attacks are occurring, but they know that there must be some reason. Enter the CIA agent who seems to know more than she’s letting on, including what her real name is – she introduces herself as Elise, but is later introduced as Sharon. Suddenly the film is thrown into a three-way conflict: Palestinians vs. USA; FBI vs. Palestinians; FBI vs. CIA. As the attacks continue with no apparent progress being made by the US agencies, the president calls for martial law in New York and sends the Army to secure Brooklyn and begin a systematic search for the terrorist cells. Again, it’s the filmmakers preying on the audience’s greatest fears – martial law and domestic terrorism – that propel this film beyond that of a normal action or techno-thriller film. The realism is incredible, and the believability factor is high, which makes this an even more disturbing and frightening film. We see fear and paranoia striking at the hearts of well-intentioned Americans who turn their backs on the premise of the freedom they so greatly value, to bring the witch-hunt to a violent end no matter what the cost. We find it hard to believe that any Americans could be so cruel, that we may mimic the actions of the Nazi’s in WWII Germany who herded the Jewish population by the millions into concentration camps. Here, the US Army herds the Palestinian population of Brooklyn into a similar camp and, although there was no mass-extermination, treated the inmates with the same degree of disdain that the Germans did the Jews. It’s frightening because it is so real, and the realism was aided greatly by the fine performances of the entire cast, particularly Benning, Washington, and Willis. It’s a very topical and timely film that shows us what could happen, and what we as Americans should never let happen … and yet, it’s a film that shows more than the desperation of a nation with its back to the wall. Excellent action and a gripping storyline make it a film that’s as enjoyable to watch as it is socially conscious.